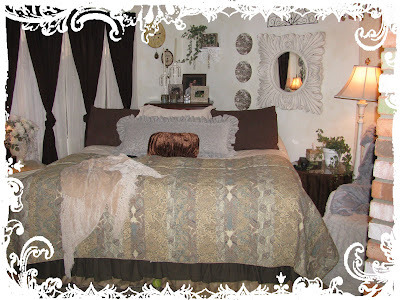 **My Desert Cottage**: More pics for you!!! Really enjoying all the lovely photos of your home. What a cozy nest! Looking forward to seeing more ideas and inspiration. Hi. I just came over from Dawn's at the Feathered Nest. Love what i have seen so far, and can't wait to go look at more of your bautfuil pics. Hi. I love the photos of your beautiful home. It is so wonderfully full of lovely and inspiring things. I too just came over because of Dawn's post. I love your style. It is charming! Pat yourself on the back girl. You have inspired me today. I will visit you often. Hi Karen...I am Ceekay from Buckeye! Welcome to the blogging world. Your home looks lovely. I love especially the columns on your patio. Great idea. 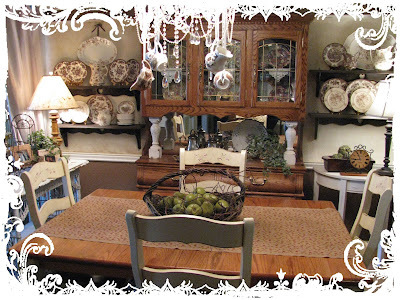 I am not shabby chic...but I don't believe in less is more either! Nice to meet you. There are a few of us out here in AZ!!! Love your stuff and look forward to following a kindred spirit. Oh, Dawn told me to tell you HI...she sent me over. Karen welcome to Blogland! I found you over at Dawn's (isn't she a sweetie) & had to pop over & say hello. I hope you will love your trip down the magic path of blogland. I have met some of the most ineteresting, wonderful, caring, sharing, talented women in the world. And so many of them are into the same things I am. Nice to find friends who "get you". Karen, I found you through Dawn of The Feathered Nest. I have an almost identical hutch... I love the two white posts you've added... now I will be looking for something to spruce up mine! The pitchers hanging from the chandelier are beautiful. I look forward to seeing more of your creative ideas! Hi, this blog is beautiful too!! Where do you find the time and the inspirations for all the things you show in your blogs? I love the way you display salvage finds. Karen, This blog lovely. You are an inspiration to all of us. You have made your home look beautiful and you artwork is amazing!